If you are not yet comfortable with yeast, I do not recommend starting the familiarization process with this bread. It's slack. It's sticky. In a nutshell, it's a frustrating pain-in-the-bum. I only say this because I've "spoken" with a fair number of friends out there who are just starting to dip their toes into the yeast pool. 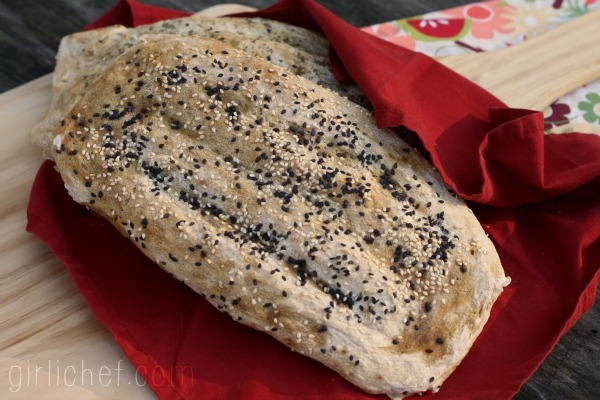 And thinking back a few years to when I was the one hanging onto the ladder with all of my might - if I had tried making this bread then, I might have cried. I definitely would have given up. So yes, beginners beware! While these loaves are tasty, with a chewy inside and a thin outer crust that is flavored with an unusual (well, not unuuuuusual-unusual...just that I hadn't used this method before now) and strangely intriguing "wash" of sorts. Plus, it's the type of bread that you can get major satisfaction from ripping hunks of it off of the loaf. Or I can, at least. 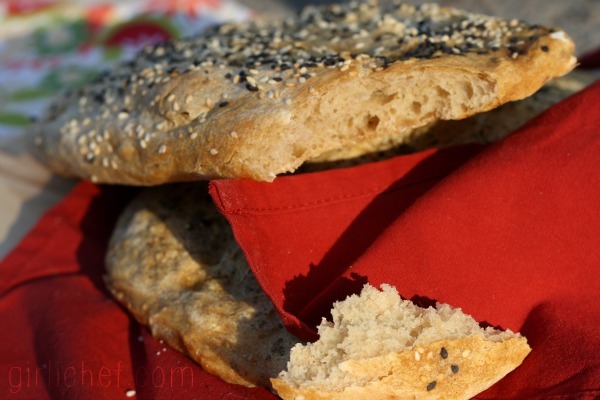 But you may want to get comfortable with a few "easier" loaves under your belt first (this Cuban Bread, this Fast Focaccia, or maybe this Yeasted Beer Bread are all good places to start - not to mention any no-knead varieties, which are what really helped me understand how yeast works). Now, if you and yeast are old buddies...or at least on good terms...tackling our Bread Baking Babes bread of the month, chosen by our brave host, Elizabeth could be some fun. If you consider cursing loose, wet dough into submission using inevitably messy hands and sheer willpower fun. And depending on the day, I do. Because really, what's more rewarding than a loaf of fresh baked bread that smells so good the neighbor kids playing in your yard comment on it!? Okay, eating it. That's just as rewarding, but you get my drift. But definitely make it on a day where you have time to give it some attention...not a day when you're rushing around doing a million things. It may have the tendency to piss you off, if you do. I think going into it with full knowledge of what you're getting yourself into is key! Pour the water into a large bowl, and whisk in the yeast. Add the flours, baking powder, and salt; stir with a wooden spoon until the dough pulls away from the sides of the bowl. Turn the dough out onto an floured board. 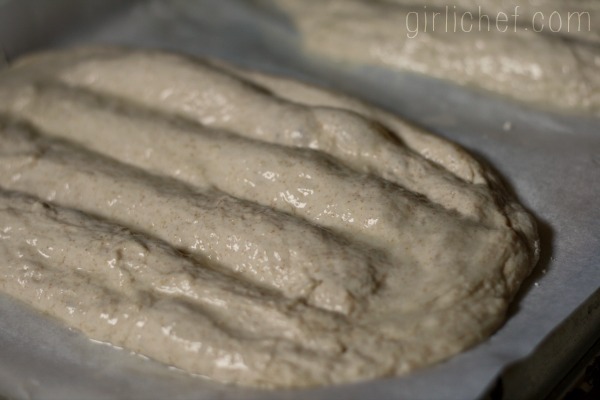 Using both hands on either side of the dough and thumbs resting on the top in the center, lift it up and flip it over in the air before plopping it back down on the board. Fold the dough in half away from you as you plop the dough down. Keep repeating until the dough is smooth. Every so often, use a dough scraper to clean the board. Stretching the dough is desired on the turns. But this won't start happening right away. When the dough is smooth, place it into a clean, lightly oiled mixing bowl. Cover with a sheet of plastic wrap and allow to rise at room temperature until doubled in size. Add all ingredients to the pan of your bread machine in the order suggested by the manufacturer. Select dough cycle. Go about your business until your bread machine screeches at you. Whisk flour, baking soda and water in a small pot, and bring it to a boil. Remove from heat and set aside to cool. Put a good coating of flour on a work surface and gently dump and scrape the risen dough onto it - yes, the dough is very loose and will come out in long, stringy strands. Using a bench scraper, cut the dough in half. Form each piece into a ball as best you can (using well-floured hands) and place them at a fair distance apart on your work surface. Cover gently with a clean tea towel, or a couple sheets of plastic wrap that have been sprayed with cooking spray. Allow to rise until doubled in size, 30-60 minutes. Flip a baking sheet upside down and line it with parchment paper. Set aside. Brush each round with the Romal - really slather the sauce on, it will keep your hands from sticking to the dough! Dip your fingers in the sauce and dimple the rounds down to form two ovals with lengthwise furrows. Transfer each to one half of the prepared baking sheet. Liberally brush ovals with the sauce once more and sprinkle with whichever type of seeds you are using. Allow the dough to stand for about 30 minutes. While your dough is standing, preheat the oven to 375° F. Once the dough has finished resting, gently lift and stretch the ovals again, taking care not to deflate them. When doing this step, wet your hands slightly (use the Romal if you have some left), and gently pull using the tops of your hands (palms down). Slide the sheet into the oven and bake for 30 minutes. I think that baking the loaves makes them look quite anemic, as traditionally they are baked in a grill or barbecue, which seems to give them a beautiful golden color. If you are able to bake them this way, I'd recommend it (instructions follow). Put a stone into the barbecue and preheat it to high. Before putting them onto the stone, pull each oval with your hands to lengthen it (using same method as above). Slide the dough onto the hot stone (parchment and all). Move the stone over to cook the bread on indirect heat. Close the barbecue lid. Every so often turn the bread around to account for uneven heat in the barbecue. Cook the bread until it is golden, about 15 minutes. Serve warm, preferably as an accompaniment to a meal of meats, kabobs, and thickly cut vegetable salads. 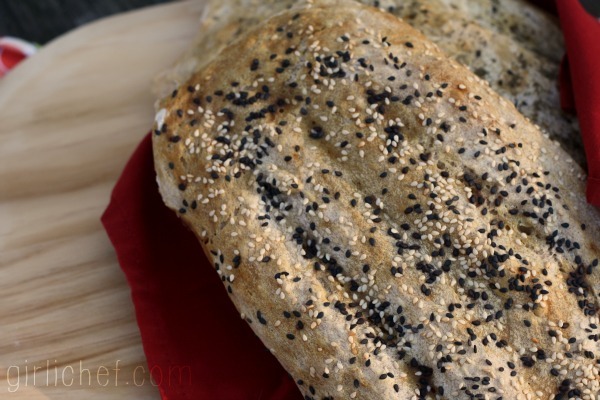 These loaves are based on this Barbari Bread. To see these done cooked on a barbecue, check out Elizabeth's post on blog from OUR kitchen. If you'd like to bake along as a buddy this month, head on over to the hosting Babe's kitchen for this month (Elizabeth at blog from OUR kitchen) for the base recipe (you're welcome to adapt) and any special instructions. Then send her your post by the 28th to receive your buddy badge and be included in the Bread Baking Buddy roundup. I hope you join us!